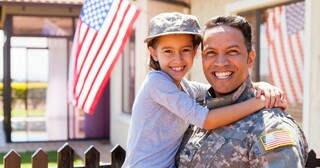 For up-to-the-minute military exchange deals, turn to MyMilitarySavings.com. We are partners with all the exchanges – the Army and Air Force Exchange Service, Coast Guard Exchange, Navy Exchange, and the Marine Corps Exchange – and we offer exclusive coupons and promotions to all our members. In fact, our mission at MyMilitarySavings.com is to help those who serve find ways to save money and enjoy as much time with family and friends as possible. But, you’ll find more than just a world of bargains when you join MyMilitarySavings.com. Your free membership gives you access to a digital community filled with military shoppers who share helpful information, from recipes and reviews to travel tips and healthy living. We hire military spouses from around the globe to bring our members up-to-the-minute coupon matchups, seasonal crafts, tips for a successful PCS, and much more. You can even participate in exciting contests to win valuable prizes! Plus, our active and engaging Facebook and Pinterest pages offer a fun way to connect with even more like-minded individuals and make friendships that know no physical boundaries. For more information about the many benefits, like military exchange deals and other exciting features, that you’ll enjoy when you join MyMilitarySavings.com, head on over to our sign-up page. Membership is free and easy!